Once you get to college it’s a different world from the high school life you’ve left behind. You have a new living situation, new friends, a new schedule and a whole lot of freedom. Don’t forget you’re there to learn! Here are some tips on how to succeed in a college class from someone who’s been there, done that. When you sign up for a class it’s important to know what you’re in for. Classes can vary greatly depending on which professor is teaching them. Do your research before the first day of class by asking friends or checking out ratemyprofessor.com for some inside info. You’ll thank yourself for knowing what to expect. The best way to succeed in a class is to develop a relationship with your professor or TA from the start. 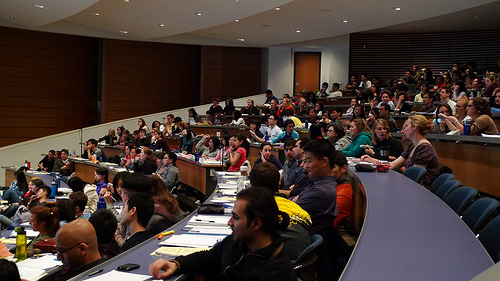 Especially in large lecture courses, it’s easy to be a face lost in the crowd. Attend office hours to put a face to your name and ask about what the professor expects from you that quarter. Ask about his testing style, figure out if he has preferences in writing styles. This type of information will give you an edge over the other 99 kids who are just guessing what the teacher would like to see. When you study in your room you’re just opening yourself up to all of the distractions that come with being at home. Your TV, bed, and roommates are right there ready to distract you. It’s better to find a corner in a library or study hall to do your homework. That way when you do go home you can relax because your homework is already done. It helps to take a class with a friend or make a new friend in every class you take. A friend works as a motivator to attend class and can also help you out when you have to miss class for one reason or another. Then when it comes time for the big test you have twice as many notes to study from and you have a built in study buddy to help you get through those all-nighters. 5. Write all due dates in your planner on the first day. This helps to plan out your quarter or semester. You can see all of your classes’ assignments and when they’re due. That way you know when you have a lot of things due at once and can plan ahead so you never feel too overwhelmed. Learn from my mistakes on this one. Doing ALL of the reading the night before the test is simply not possible. Do yourself a favor and do the readings on time. Not only will you feel more prepared come test time but you’ll be able to understand class a little bit better on the day they’re due. Professors will often give you exercises that they recommend you do but you’re not required to turn them in. Do them. “But they won’t be graded!” you say. Not directly but remember that practice makes perfect and the professor wouldn’t assign it if they didn’t think it would help. You’ll thank yourself for practicing the next time there is a pop quiz. This one may seem obvious but once you get to college it’s very easy to decide that you’d rather keep sleeping than head to class. Generally speaking there is no consequence for not going…except that you aren’t learning all of the material! Professors will often offer bonus points, cover things not in the readings or give pop quizzes in class so it’s best to attend. Plus you’re paying a lot of money to attend you might as well get your money’s worth.